Legal assistant Barb Somers is aiming for European glory when she represents Great Britain as part of a gruelling international athletic event. 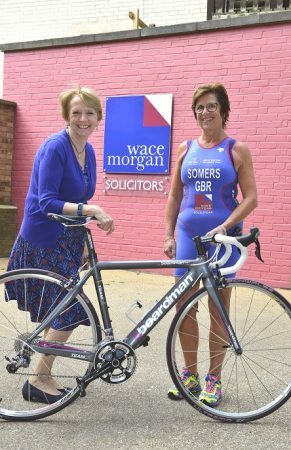 Barb, who is 63 and works for Wace Morgan Solicitors in Shrewsbury, has qualified for the European Triathlon Championships to be held in Düsseldorf next week. She has been competing in sprint triathlons, which involve a 750m swim, a 20k bike ride and 5k run, for around 10 years and is a member of the SY Tri Shrewsbury Triathlon Club. The German event, on June 24 and 25, will see her up against 18 other competitors in the 60 to 64 age group. “I am looking forward to the European championships and have had to take part in several other events in order to qualify,” said Barb, who lives in Cressage and works in the commercial department of Wace Morgan’s Shrewsbury head office. She has a successful record in national and international events and has previously taken part in the GB Age Group Team, finishing 15th in the world triathlon championships. “I hope to complete the Düsseldorf event in a good time, preferably under one hour 30 minutes, but it is going to be hard as I am at the top of my age group now and I am sure there will be plenty of women three or four years younger than me there,” Barb said. Wace Morgan has agreed to sponsor Barb by providing her with a new tri suit which she will wear at the championships. She is also now a British Triathlon Federation official/referee which takes her all over the county officiating in events.